How to create good content, and which points you should consider when doing this is explained in the article: “The Green Customer Journey: Unique Content With Informative Evergreen.” To continue on from this, I explain in this article what differentiates content from content marketing, and how you can turn your content into a link magnet. People escape sensory overload in many ways. That means that the readers have to be spoken to directly when they are receptive and see a benefit in the offer – only then will they consider reading the content. Content marketing is a continuation of content creation, and essentially involves distributing the content effectively. In this article, I deal with how you can organize and implement your content marketing campaigns, what goals you should focus on, and what channels you can choose for different strategies. Transactional content is usually found in the area of e-commerce – usually on product and category pages. This content should positively influence transactions. Product descriptions in online shops can for example highlight specific features of products, therefore encouraging the customer to purchase the item. Often, customer or potential customers just glance over description texts to get an overview of the product characteristics and specific features. Transactional content is therefore an important criteria for shop ratings, and should offer the user assistance when necessary. Branding content supports the development of a brand to a strong flagship of a company. Strong brands answer their customers’ questions in every respect, are available, and are the leaders in their segment. Branding content mostly contains informative content which functions for both areas – for search engine optimization in the form of an optimized landing page, as well as for content marketing in the form of articles which offers the user added value. For example, a hotel has a landing page which addresses guests with dogs in particular. SEO and content marketing differentiate here: the content can be both optimized for relevant keywords and, at the same time, offers a thematic added value for the user. Not only is the hotel offer for guests with dogs displayed, different hiking routes are also suggested which are suitable for holiday makers with dogs. Primarily, the landing page is for marketing the hotel’s wide offer and, through the keywords, should particularly promote booking from holiday makers with dogs. How does branding content as part of content marketing look? Often, such content can be found in separate magazine categories or blogs. They offer the user added value, cover a wide topic area and answer every question which could interest a customer aside from the actual product offer. Using an online shop for outdoor items as an example, it’s easy to recognize that the point of view of the reader was considered: there are no comprehensive entries about additional articles such as impregnating spray or insoles, but, for example, texts regarding care of shoes; topics, which are actually interesting for the buyer, and offer added value. The main goal of this content is an inclusive customer care, portrayal of expertise and the strengthening of the brand. Social content includes all content such as texts, pictures or videos which are distributed on public platforms. Such content increases reach, awareness and engagement of a brand – typical content marketing goals. With particularly outstanding content, you can even produce viral content. This distributes itself across the internet in a short space of time, and creates awareness. Often, this is content which can be created quickly, for example images, videos and GIFs. But, infographics or texts also have the potential to go viral. The more interesting, funny, emotional and crazy social content is perceived by the users, the higher the social engagement. No matter the reason, when content is seen as worth sharing, it will be shared, recommended, liked or commented until half the world is smiling. The goal of Content Marketing is to distribute and market your content effectively. Ideally, your content will be so good that it will be distributed automatically, for example through recommendations and a lively and inspired social engagement. By using and implementing these 4 basic tips, conventional content can be turned into content that that is worth sharing. Events that are linked with strong emotions stay in people’s minds – whether it’s the wedding of a best friend or the birth of your children, emotions strengthen our memories. These reminders can be transferred to content marketing, for example with emotional headlines, stories and images. The more we move the user with our content, the higher the chances that the user will remember the content. Before offers are perceived and products bought, the user will often compare. Our content should be created in such a way that it already offers the reader a comprehensive comparison. That creates a clear added value for the user, and saves a lot of troublesome research. Often, it’s enough to make it clear to the reader that we, with our offer and our content, are the best option. Comprehensive, detailed comparison is therefore not a prerequisite. When choosing your content marketing topics, you should bear in mind that the topic should be suitable for a wide audience. To create content with mass appeal, you should choose niche topics, as they have a greater success potential. The more suitable your content is for the masses, the more potential readers you have. The more readers we reach, the more well-known our content will become. Therefore, content for content marketing should deal with a specific topic area. In this way, you can reach people who are actually interested and who read the content properly, rather than just skimming through. Unicorns and flamingos rule our world at the moment – they’re pictured on product packaging, decorate smart phone cases, and are hyped. If you want to speak to the Zeitgeist of today, you can simply use current pop culture, and use hypes as eye catchers. In this way, you don’t only create awareness, but you also push sales numbers, which this example proves. In this example, the production of the limited edition was extended due to high demand – an ideal opportunity to give the users a look behind the scenes in a blog article: how does this work? When can I order? How long does the delivery take? 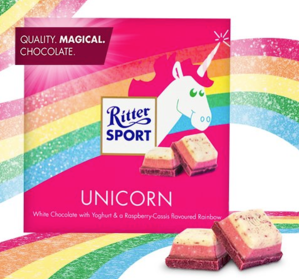 These are all questions which are interesting for the customers who are waiting for the product, and can be answered in the Ritter Sport blog – an ideal basis for automatic distribution. A campaign regarding the target group of content needs a clear direction. There are many different approaches for the design of a campaign. Proven possibilities are, for example, the creation of personas, in which personalities are in the foreground. However, with whole target groups, this is often too general, and with personas often too specific. A further possible approach for the design of a campaign is the orientation of the customer journey, or the Google consumer funnel. Here, less focus is given to personalities. It’s more about defining at which point of the purchase process, from the recognition of need to the long-term customer relationship, a person becomes a potential customer, and what they therefore need from our content. A potential customer won’t immediately decide to buy a product or to make use of a service. Instead, the customer is more likely to have several attempts, repeatedly visit product pages, and they will think-out purchasing decisions. Everything takes time – a purchase included. In both starting phases of the customer journey, pre-awareness and awareness, a potential customer does not yet have a concrete need for a product, a service or a solution to a problem. If a need is awoken or a solution to a problem required, the potential customer is ready to inform themselves in detail about relevant offers. From a variety of approaches, the user makes a choice, defines their requirements, and makes priorities. An interested and willing-to-buy target group must be offered a perfect product portfolio. A personalized purchasing experience should be created that leads a potential customer to decide for this offer. After purchasing, the customer has to be convinced that they have made the right decision. Only then they will be open for further purchases, and will recommend the brand. The customer service after purchasing is therefore crucial for a long-term customer relationship. Depending on the orientation and intention of the content, different target groups will be spoken to. These target groups also use different channels and won’t be as receptive as each other in every format. Making a brand well known through building up reach is a core goal of content marketing, as well as strengthening image, external presentation and the stimulation of social engagement. Content marketing can also help to remedy deficits in public image and customer contact. If a brand suffers from damages to image, loses its proximity to customer, their image can be put back on the right track using relevant content. To influence user engagement and further important KPIs with content marketing, conventional content must become link magnets which are helpful and relevant for the user, and worth sharing. Good content should be read. To reach the readers, the content has to be distributed through a well thought-out outreach strategy. It is important that the content is only shown on your website – only in this way can you create magnets which attracts external links and readers. The more relevant (the more useful, comprehensive, entertaining, better) your content is, the greater its sharing-worth for the reader. With good content, you can automatically turn your reader into a promoter, and generate mentions or recommendations in the form of links. Blog or advice areas without shopping cart elements or internal links to product pages show your readers and potential link providers that you value the creation of helpful content for the user. That increases the chance that your content will be recommended and linked. Aside from a comprehensive research for relevant cooperation partners and potential link providers, a fully developed negotiation strategy is required. This requires a lot of time and patience. When you make contact, rely on cooperation and reciprocity to achieve absolutely natural and high-quality links. With content outreach, trust above all in cumulative effects – your patience and hard-work will pay off. The first answers to your questions will be a long time coming. Don’t let yourself become discouraged, keep going, because the more requests you send, the more answers you’ll get. Content for content marketing should offer added value, portray an area of interest of your target group, and eventually convince with relevance and quality. To ensure that your content definitely reaches its readers, a clear structured outreach strategy is required. To define who you want to speak to, you should orientate yourself to the customer journey. Depending on the phase, the potential customer has different demands that we need to fulfil with our content. In the first step, we need to define at which point of the purchase process, from the recognition of need to the long term customer relationship, we want to pick up our target group. The right target group approach alone is not enough. Because not every public uses the same channels or is suitable for the same formats, the right decision has to be made here. Depending on the orientation and intention of the content, relevant channels and formats have to be chosen. Only in this way will the target group approach be efficient and promise success. Successful content marketing doesn’t only influence your own core goals such as awareness, reach and branding. With the help of good content and its correct distribution, an important quality feature in online marketing is created that influences much more than satisfied readers. Published on 10/20/2017 by Christina Münzer. Christina Münzer trained in marketing communication management, and has expanded her professional know-how with a degree in international business administration at the University of Augsburg, with a focus on marketing. She has been working in the online marketing industry since the beginning of 2015, and is currently content marketing manager at the digital marketing agency xpose360 GmbH.